Alta Planning + Design. Memphis Bike Share Feasibility Study (Feb., 2013). Amos, P. “Public and Private Sector Roles in the Supply of Transport Infrastructure and Services: Operational Guidance for World Bank Staff” in Transport Papers (World Bank, May 1, 2004). Andrade, K., and Kagaya, S. Cycling in Japan and Great Britain: A Preliminary Discussion (European Regional Science Association, 2011). Bartunek, R.-J. “On Your Bike for Commuter Tax Benefits in Europe” in Reuters (June 21, 2011). Barz, S. “Stuff I’ve Read About Vélib’” on An Urbanist in Paris (Feb. 7, 2013). Benchimol, M., et al. “Balancing the Stations of a Self Service ‘Bike Hire’ System” in RAIRO — Operations Research 45 (2011) 37–61. DOI:10.1051/ro/2011102. Bernstein, A. “Citibank Is Sponsor of the NYC Bike Share” in TransportationNation (May 7, 2012). Bernstein, A. “NY’s Rocky Road to a Bike Share Sponsor — or Why The Rollout Will Take Longer Than Planned” in TransportationNation (May 8, 2012). Bernstein, A., et al. “Ten Percent of Citi Bike Docks Appear to Fail Each Day” in TransportationNation (June 11, 2013). Bible, E. “Exploring the Politics of Parking in San Francisco” in SF State News (Feb. 12, 2009). Bicycle Helmet Research Foundation. A Tale of Two Cities (Nov., 2012). Bonnette, B. The Implementation of a Public-Use Bicycle Program in Philadelphia (University of Pennsylvania, Dec. 19, 2007). Botsman, R., and Rogers, R. What’s Mine Is Yours (Harper Business, 2010). Boutet, A. “CycloChrome: A Tour de Force!” in Desjardins and Me Vol. 7 No. 3 (2012). Brady, B. “Two-Thirds of London’s Boris Bikes Need Repairs” in The Independent (Feb. 20, 2011). British Library Board. Learning, Dreamers and Dissenters. Cervero, R. “State Roles in Providing Affordable Mass Transport Services for Low-Income Residents” in International Transport Forum Discussion Papers No. 17 (OECD Publishing, 2011). DOI: 10.1787/5kg9mq4f4627-en. Coward, L. “Boris, Barclays and the Big Blue Branding” in CorpComms (Oct. 10, 2010). Cruz, M. “The Circle of Life” in Cycling Mobility (Jan., 2011). Daddio, D.W. Maximizing Bicycle Sharing: An Empirical Analysis of Capital Bikeshare Usage (University of North Carolina at Chapel Hill, 2012). Dale, D. “Bixi: Condo Developers Contribute $1 million to Toronto Bike-Share Expansion” in The Star (Sept. 11, 2013). DeMaio, P. “The Problem of Moral Hazard” on The Bike-Sharing Blog (Apr. 27, 2009). DeMaio, P. “Bike-Sharing: History, Impacts, Models of Provision, and Future” in Journal of Public Transportation Vol. 12 No. 4 (2009). DeMaio, P. “Copenhagen Is Getting Ready to GOBIKE” on The Bike-Sharing Blog (Nov. 6, 2012). Di Caro, M. “DC Bike Shop Owners See Big Returns from Bike Share” in TransportationNation (June 29, 2012). 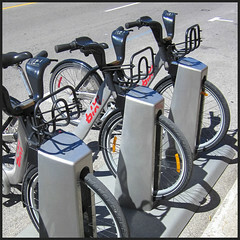 Doolittle, R. “Toronto’s Bixi Boondoggle: Expecting Bike-Share to Pay its Own Way May Have Doomed it” in The Star (Apr. 19, 2013). Erlanger, S., and De la Baume, M. “French Ideal of Bicycle-Sharing Meets Reality” in New York Times (Oct. 30, 2009). Erskine, C. “Boris Bikes Launch Despite Many Concerns” in Sky News HD (July 30, 2010). European Conference of Ministers of Transport. National Policies to Promote Cycling (ECMT, 2004). Faber, G. “Amsterdam: New Challenges for a Cycling City” via Slideshare Cycling Amsterdam for Canada 2012 conference. Falconer, T. “How the Politics of Parking Can Defile a City” in The Star (May 11, 2008). Farrell, SP. “Biking Has its (Tax) Benefits. Or Does it?” in New York Times (Apr. 14, 2009). Fischer, C.M., et al. “Prevalence of Bicycle Helmet Use by Users of Public Bikeshare Programs” in Annals of Emergency Medicine Vol. 60 Issue 2 (Aug., 2012) 228–231. DOI: 10.1016/j.annemergmed.2012.03.018. Fishman, E. “Fixing Australian Bike Share Goes Beyond Helmet Laws” in Conversation (Nov. 26, 2012). Fishman, E., et al. “Barriers and Facilitators to Public Bicycle Scheme Use: A Qualitative Approach” in Transportation Research Part F: Traffic Psychology and Behaviour Vol. 15 Issue 6 (Nov., 2012) 686–698. Flegenheimer, M. “Bike Sharing? Sure. The Racks? No Way.” in New York Times (May 14, 2013). Goldsmith, S. “Defining the Role of Government” in Governing (Oct. 20, 2010). Grozdanic, L. “Tokyo’s Eco-Cycle Park Bicycle Elevator Stores 144 Bikes Underground” in Inhabitat (June 11, 2013). Hardin, G. “The Tragedy of the Commons” in Science Vol. 162 (1968) 1243–1248. Henderson, J. “The Spaces of Parking: Mapping the Politics of Mobility in San Francisco” in Antipode Vol. 41 (2009) 70–91. Henley, J. “Rentabike Moves Up a Gear from Curiosity to Runaway Success” in The Guardian (Aug. 12, 2005). Hill, D. “Boris Johnson Bike Hire Scheme: And the Winner Is” in The Guardian (Aug. 12, 2009). Hoscik, M. “Beneath the Headlines, Who Really Funds London’s Cycle Hire Scheme?” (Feb. 20, 2012). Hoscik, M. “Boris Bikes Sponsors Barclays Fined for Interest Rate Rigging” in MayorWatch (June 27, 2012). Hoscik, M. “Exclusive: TfL Reveals How Much Barclays Has Paid for Cycle Hire Scheme” in MayorWatch (Dec. 19, 2012). Institute for Transportation & Development Policy. The Bike-Share Planning Guide (2013). Jensen, P., et al. “Characterizing the Speed and Paths of Shared Bicycles in Lyon” in Transportation Research Part D: Transport and Environment Vol. 15D Issue 8 (2010) 522—524. Kaye, L. “CitiBank Shells out $41M to Sponsor NYC’s Bike Share Program” in Triple Pundit (May 10, 2012). Kumar, A., et al. “A Systems Perspective of Cycling and Bike-Sharing Systems in Urban Mobility” (Singapore-MIT Alliance, 2012). Lardinois, F. “YC-Backed viaCycle Is a Zipcar for Bikes, Coming to San Francisco Soon” in TechCrunch (Aug. 15, 2012). Larsen, J. 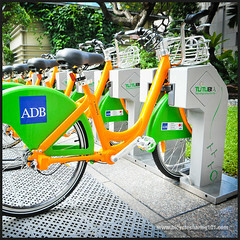 “Bike-Sharing Programs Hit the Streets in Over 500 Cities Worldwide” in Plan B Updates (Earth Policy Institute, Apr. 25, 2013). Larsen, J. “Dozens of U.S. Cities Board the Bike-Sharing Bandwagon” in Plan B Updates (Earth Policy Institute, May 14, 2013). Lesh, A., and Douwes, C. Frequently Asked Questions and Answers Concerning Bike Sharing Relative to the United States Department of Transportation (2012). Lewis, T. “Has London’s Cycle Hire Scheme Been a Capital Idea?” in The Observer (July 10, 2011). Lucas, L. “Helmet Law Makes Nonsense of Bike Hire Scheme” in The Age (July 23, 2010). MacDonald, C. “The Bike Share Station Sponsorship Dance” in Atlantic Cities (Nov. 29, 2011). Mairie de Paris. Vélib’ press release (2007). Matchan, L. “Boston Goes Aggressively after Helmetless Bicyclists” in Boston Globe (Nov. 9, 2012). McClintock, H. Planning for Cycling: Principles, Practice and Solutions for Urban Planners (Woodhead Publishing and CRC Press, 2002). McGrane, S. “Commuters Pedal to Work on Their Very Own Superhighway” in New York Times (July 17, 2012). 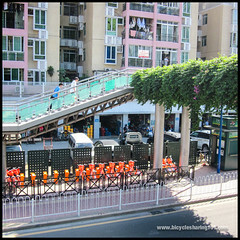 Meddin, R. “The Bike-Sharing World — Last week of January 2013” on The Bike-Sharing Blog (Jan. 26, 2013). Middaugh-Bonney, T., et al. “Bicycle-Related Head Injury Rate in Canada Over the Past 10 Years” in Injury Prevention Vol. 16 Issue A228 (2010). Midgley, P. “The Role of Smart Bike-sharing Systems in Urban Mobility” in Journeys (May, 2009) 23–31. Midgley, P. Bicycle-Sharing Schemes: Enhancing Sustainable Mobility in Urban Areas (New York: UN Department of Economic and Social Affairs, 2011). Miller, S. “As Citi Bike Stations Appear, DOT Recaps How People Helped Pick Sites” on StreetsBlog (Apr. 8, 2013). Moore, T. “CityCycle Won’t Follow Melbourne’s $5 Helmet Lead” in Brisbane Times (Aug. 8, 2011). Nelson, L.J. “LA Bike-Sharing Program Hits a Snag” in Los Angeles Times (June 26, 2013). New York City Department of City Planning. Bike-Share Opportunities in New York City (Spring 2009). New York City Department of Transportation. NYC Bike Share: Designed by New Yorkers (2013). NICHES. New Seamless Mobility Services: Public Bicycles — Policy Notes (2007) 5. Nielse, B.H. The Bicycle in Denmark: Present Use and Future Potential (Danish Ministry of Transport, 1993) 52. OBIS Project. 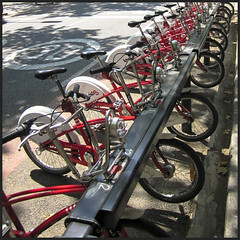 Optimising Bike Sharing in European Cities — A Handbook (June, 2011). OBIS Project. Final Project Report (Aug., 2011). Ostrom, E. Governing the Commons: The Evolution of Institutions for Collective Action (Cambridge University Press, 1990). Ostrom, E., and Crawford, S. “A Grammar of Institutions” in American Political Science Review Vol. 89 No. 3 (Sept., 1995) 582—600. Ostrom, E., et al. Rules, Games, and Common Pool Resources (University of Michigan Press, 1994). Peñalosa, A. Repeal of the Helmet Law in Mexico City. Press release for ITDP Mexico City, 2010. Perreaux, L. “Montreal’s Bixi Pedals Hard for More Funds from the City” in Globe and Mail (May 17, 2011). Petersen, T. “Identification of Key Attributes for Bike Sharing Systems — Report” in OBIS WP3 (Oct. 31, 2010). Profita, C. “Bike Sharing’s Environmental Track Record” in Ecotrope (Dec. 14, 2012). Pucher, J., and Buehler, R. “Making Cycling Irresistible: Lessons from the Netherlands, Denmark and Germany” in Transport Reviews Vol. 28 No. 4 (2008) 495–528. Pucher, J., et al. “Infrastructure, Programs and Policies to Increase Bicycling: An International Review” in Preventive Medicine (2010) 106–125. Ringham, R. “When Is a Cyclist Not a Cyclist?” in Cycling Mobility (Jan., 2011). Robinson, D.L. “Head Injuries and Bicycle Helmet Laws” in Accident Analysis and Prevention Vol. 28 No. 4 (1996) 463–475. Rojas-Ruede, D., et al. “The Health Risks and Benefits of Cycling in Urban Environments Compared with Car Use: Health Impact Assessment Study” in British Medical Journal Vol. 343 (2011). Saltelli, A., et al. Global Sensitivity Analysis: The Primer (John Wiley & Sons, 2008). Schmitt, A. “Chattanooga Bike-Share: Lessons for Smaller Cities” on DCStreetsBlog (Feb. 11, 2013). Schoner, J.E., et al. Sharing to Grow: Economic Activity Associated with Nice Ride Bike Share Stations (The Hubert Humphrey School of Public Affairs, Aug. 31, 2012). Schroeder, S. “Personalized Public Transport” on Schroeder Solutions (May 13, 2012). Shaheen, S., and Guzman, S. “Worldwide Bikesharing” in Access No. 39 (Fall 2011) 26. Shaheen, S., et al. “Bikesharing in Europe, the Americas, and Asia: Past, Present and Future” in Transportation Research Record: Journal of the Transportation Research Board No. 2143 (2010) 159–167. Shaheen, S.A., et al. “Public Bikesharing in North America: Early Operator and User Understanding” in Mineta Transportation Institute Report 11-26 (College of Business, San José State University, June, 2012). Shoup, D. “The High Cost of Free Parking” in Journal of Planning, Education and Research Vol. 17 (1997) 3–20. Shu, J., et al. “Bicycle-Sharing System: Deployment, Utilization and the Value of Re-Distribution” in ResearchGate (Dec. 27, 2010). Silverberg, B. “Faulkner May Sponsor JP Hubway Station” on JamaicaPlainPatch (Feb. 22, 2013). Sutton, M. “London Bike Hire Faring Better Than Paris Scheme for Write Offs” in Bike Biz (Feb. 22, 2011). Tang, Y. 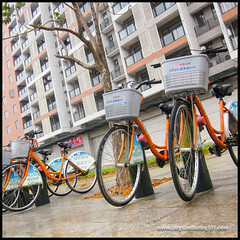 The Bike-Sharing System in Chinese Cities — Beijing, Shanghai and Hangzhou (CAUP Tongji University and Institute of Urban and Regional Development, Berkeley, Apr. 6, 2010). The Financial Brand. Citi Bikes (May 21, 2012). Thompson, D., and Weissmann, J. “The Cheapest Generation” in Atlantic Mobile (Aug. 22, 2012). Toole Design Group and Pedestrian and Bicycle Information Center. Bike Sharing in the United States: State of the Practice and Guide to Implementation (Sept., 2012). 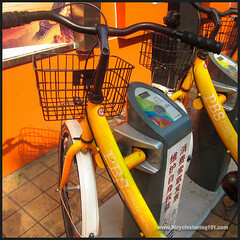 Tse, K. “A Look at Taipei: Bike-Sharing Programs and Sustainable Tourism” in Brand Karma (Jan. 9, 2013). Vance, S. “Bike Chicago’s Protest of Alta Bicycle Share Winning Bike Sharing Contract” in Grid Chicago (June 20, 2012). Vanderbilt, T. “The Best Bike-Sharing Program in the United States” in Slate (Jan. 7, 2013). Victoria Transport Policy Institute. “Transit Oriented Development” in TDM Encyclopedia (2012). Walker, P. “More Cyclists Means Fewer Accidents, Says Report” in The Guardian (May 7, 2009). Wright, R. “US Big Three Look to Auto Alternatives” in Financial Times (Dec. 23, 2012).